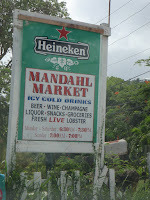 About a half mile from our studio there’s a little grocery store called the Mandahl Market that sells a little bit of everything. It’s somewhat expensive, but good for picking up a bag of ice, a few limes, or an emergency jug of water. However, it’s their kitchen, not their convenience, that makes them noteworthy. If you walk through the little store and pass the freezer area you’ll find yourself standing in front of a tiny deli counter. 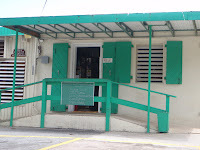 They sell potato salad, chicken salad, basic lunch meats and cheeses, and a daily menu of hot dishes such as fried plantains, beans and rice, and mac and cheese (today's favorite food). Last year when we visited St. Thomas for the first time, I developed an addiction to the chicken salad. It was a little spicy, creamy, and very salty. Fortunately on this visit I asked the cook how she made it—good timing because it was her last day (don’t tell anyone, she said, they don’t know yet). She used the leftover rotisserie chicken that don’t sell by the end of the day, and shredded it, then added thyme, chopped green pepper, black pepper, and garlic. I’m planning to experiment with proportions when I get home in hopes of recreating it. The torch has been passed to a new cook whose chicken salad is chunkier and less spicy. It has red pepper instead of green pepper, and she doesn’t leave the skin on the chicken, which I think gave it a better flavor. It’s still really good, just a little different. The other wonderful thing they do in that kitchen is fry things. At the cash register you can pick up a paté (pronounced much like the French pâté), which is a pocket of fried or baked dough stuffed with various meat fillings and spices. 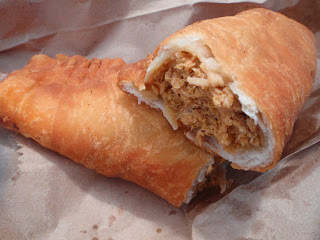 It’s a traditional West Indian/Jamaican food that looks a lot like a giant empanada. Not being a fan of fishy things, I’ve eaten my fair share of chicken and beef patés, which make a filling, though somewhat greasy lunch or breakfast treat. They’re very handy for a beach picnic or for taking along on the ferry to St. John. 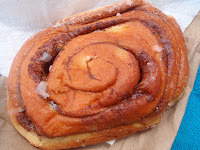 Last but not least, the “cinnamon fry” that you can find hanging out beside the patés—it's basically an oversized cinnamon Danish that doesn't look like much at first glance, but is so soft it seems to melt in your mouth. If you get one earlier in the morning when it’s still a little warm, I recommend sitting in the car and stuffing your face.